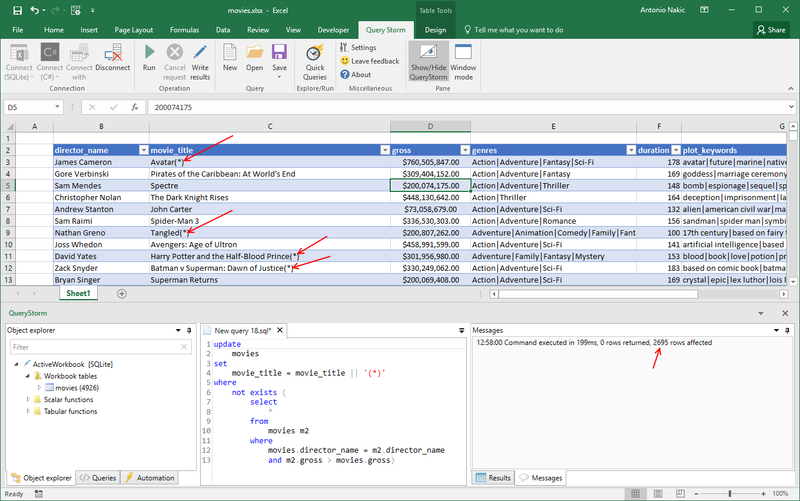 QueryStorm comes with a SQLite database engine that can work with Excel tables as if they were database tables. In this example, I use a public dataset with data on 5000 movies scraped from IMDB. 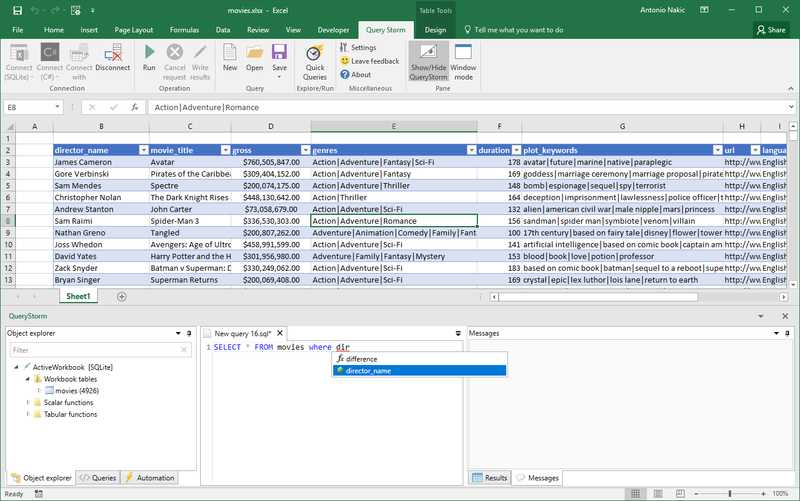 Clicking the connect button pops up QueryStorm and opens a SQLite connection that sees Excel tables as database tables. Once connected, we can start querying. 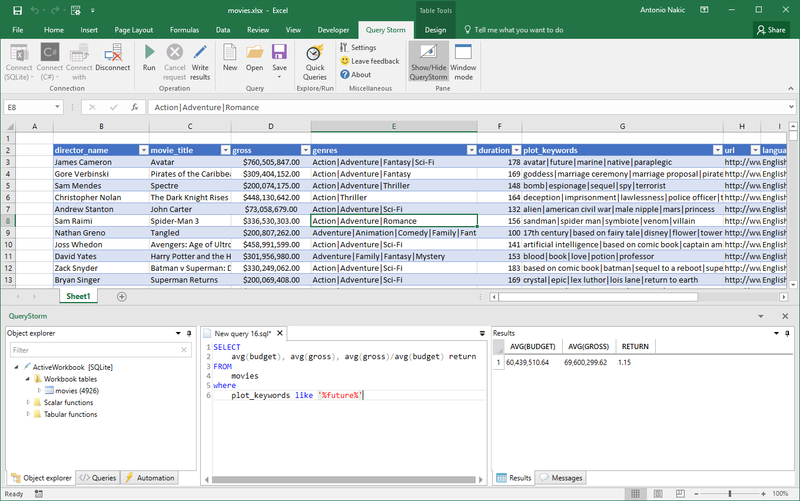 The most important thing to know is that QueryStorm works with Excel tables, not sheets. It looks like movies about the future are good business; they return 115% of the budget spent. In the above query, I'm looking for all movies such that no movie from the same director grossed more. There were 2695 rows updated, one per director. We can also insert the results of a select statement to insert a bunch of rows at once. When using the SQLite engine, all workbook tables get two extra hidden columns: __address and __row. These columns are hidden, meaning that SQLite will not include them in the results if you just specify * in the select list, but you can include them explicitly in the select list when you need them. 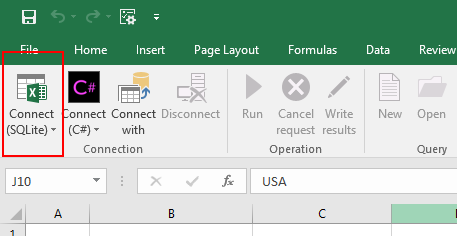 The __address column is for locating the original row in Excel. Double-clicking an address in the results (or the row header, if an address is present in the row) will select the row in Excel. We can also use it to perform formatting operations on the row. The __row column specifies the original index of the row in Excel. We can use this to preserve the original ordering of rows. It's also convenient for some other operations, e.g. self-joins without duplicates.